Christmas is a time for hospitality, sometimes painfully offered, sometimes grudgingly accepted. In that, the season reflects its Christian origins. Hospitality is strongly endorsed in Christian rhetoric which commits its followers to welcome others sensitively and painstakingly. This year hospitality was invoked in the Catholic decision to make provisions for groups of Anglicans to join the Catholic Church while retaining much of their Anglican heritage. The gesture was described as a hospitable response to a repeated request. But some suspected that beneath the rhetoric of hospitality might have lain a more imperial reality. They believed that the gesture was designed both to show disapproval of Anglican churches that accepted women and overtly gay candidates for ordination, and to welcome converts who shared that disapproval. Of that, more later. In the Christian tradition hospitality reflects God's hospitality to human beings. The Old Testament emphasis on hospitality to strangers is rooted in God's welcome to the Israelites when they were slaves in Egypt. In the New Testament hospitality is made more radical. It applies to our enemies as well. We are to walk the extra mile, to offer our suit when asked for our shirt, to treat our enemies as we would our friends. This deepening of hospitality reflects a change of focus from the one who offers hospitality to the one who asks for it. In the Christmas story, God does not simply offer hospitality to us, but seeks hospitality from us. As the carols tell us, the Son of God comes as a baby needing shelter and food, totally dependent on others. In asking for hospitality, God enables us to accept it ourselves. Jesus also reverses the usual pattern of hospitality when he sends out his disciples to preach the Gospel without money, spare clothing or food. They have no option but to seek hospitality from the people to whom they preach. Those who offer them hospitality will be more likely to listen favourably to God's word. To ask for hospitality from strangers, of course, leaves you naked before the calculating. They can ignore your need and use you to send signals to others. But that is also written into the Gospel story. One of the most poignant stories is of Jesus weeping over Jerusalem because the city did not offer hospitality to God's word. The practice of hospitality is central in the Christian tradition. The unity of the early church was cemented by a network of hospitality. Christian preachers travelled, were welcomed, shared their insights into the Gospel, and moved on. Later the churches became known for the welcome they gave to strangers and refugees who were repelled by civil institutions. As the rulers of the Empire became Christian, monasteries became places of hospitality, churches places of sanctuary, and hospitals developed out of the guest houses that sprouted along the pilgrim routes. Where churches are healthy they are inventive in offering hospitality to those in need. In the Australian Catholic Church, the Simon communities, the Vinnies, soup vans, asylum seeker refuges, Catholic Worker communities, hospices for the dying and radical congregations like St Mary's in Brisbane provide a welcome to those who have no home in society. Other churches have similar initiatives. Here the rhetoric of hospitality is matched by rough-edged practise. But the reality of church life is often one of exclusion. That has also recently been the case in Catholic relations to Anglicans. In Bendigo the Anglican Church recently ordained seven deacons, four women and three men. Their Cathedral (pictured) was in need of repair, leaving them without a suitable space for the celebration. 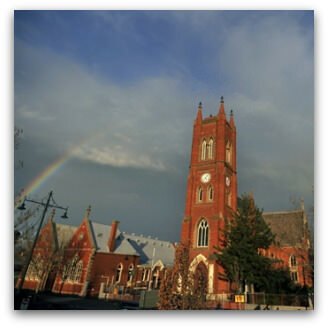 The Catholic Bishop, after consultation, offered them the use of a Catholic church in Bendigo. To his embarrassment he was forced later to withdraw his offer of hospitality, leaving them homeless for the ordination. It was thought that the ordination might send the wrong signals. Mercifully, the Anglicans were not left to scour the fields and caves to find a place of celebration. They were offered hospitality in the Uniting Church. On hearing such stories we are tempted to fall back on the Irish saying, 'Jesus wept'. But of course Jesus wept on the first Christmas, too, as do all children who come into the world. Most babies also weep when they are baptised. Perhaps they sense the inhospitable aspects of world and church. Breaches of hospitality are part of our human condition. Christmas is about forgiving the past and being enticed into hospitality. Catholic ordination is not the same as Anglican ordination. What planet does A Hamilton live on? Does his hospitality stretch to ordaining rabbis, buddhist monks, hindus, unitarians, imams and witches at the cathedral. Or would he have to draw a line. There is a difference between offering hospitality [cups of tea in halls and cafes and restaurants are fine] and offending God himself by forgetting who you are. Thank you Andrew for your timely reminder - as the Christian churches read through Luke's Gospel emphasis on God's hospitality in this new year's lectionary. I'm encouraged by the warmth of hospitality shared by the churches involved in inter-faith relations here in Geelong. St Mary's, Wesley Uniting, and Christ Church Anglican give common leadership in ecumenical outreach. There's still room for improvement! Firstly, Andrew Hamilton is a Jesuit priest before being a lecturer ... or are there two Andrew Hamilton's? If not, then give him his proper recognition as a Jesuit in a Jesuit publication first. Secondly, the Catholic Cathedral is not a place for hire like a theatre. It is a place for Catholic functions first and then joint ecumenical functions. The fact that the Anglicans have not put their money where their religion is i.e. repairing their cathedral is no reason why a Catholic place should be used for their ceremony. It would have been good to see where the "snub" came from. Was it direct from Rome following tales from local dobbers or did it come from within Australia? Christians seem to do the best job at being unchristian. very sad. Fr Andrew Hamilton makes a national issue of an unfortunate set of circumstances, some of which were out of the control of the Catholic Bishop of Bendigo. There was, I'm sure, sad feelings all round, not only in Bendigo, but also in the Vatican, where, if the truth be told, allowances for such things have been made in the past. It was, as I understand it, an attempt to avoid deeper feelings because of the offer to Anglicans who can't accept women's ordination. In many families, we face this all the time, so we do as best as we can, maybe even separating some groups. Inhospitable, no, just dealing with a woundedness and doing the best we can. Let's be fair, Fr Andrew. Madeleine's words are heartfelt. Discussions of this kind sometimes founder on the difference between the word Christian and the word Catholic. Are they the same thing? Andrew gives a careful explanation of hospitality in Christian tradition, which clearly goes beyond simply extending hospitality to "people like us". Likewise, putting your money where your religion is is one thing, but it doesn't have anything much to do with the instruction and example of hospitality. As I understand it, hospitality is not just about being hospitable to perfectly decent Anglicans but to complete non-starters like Samaritans. Imagine a young man or woman in their 20s reading this correspondence. This young person attended a Catholic school and remembers liturgies that were inclusive, joyous, uplifting; he/she now reads that there are people who are so exclusivist, so narrow in their thinking, that they find scandal in followers of Jesus (who happen to top their egg from the other end) wishing to use "their" building. Andrew's article and the correspondence it has generated are a strong reminder of the need for Catholic schools where in my experience tolerance and mutual respect, take priority over narrow sectarianism. Wouldn't it be lovely if Buddhists or Muslims felt they could request the use of a Catholic church for one of their ceremonies. Jesus All About Life perhaps didn't reach to Bendigo! Interestingly is the word "god" in Bendigo. Skye....I doubt if God gives a stuff! After all, no individual in the New testament Church is referred to as a priest. Surely, love is what we will be judged on. I remember our local Anglicans were graciously permitted to celebrate Eucharist in the local Catholic Church because their church building was being renovated. Also, in our local Catholic Church an Anglican female priest preached at an ecumenical service. Shock! Horror! Female deacons are a part of early Holy Tradition. What is the problem for the hierarchy? Not Tradition it seems. Then what? In our town the Anglicans have their service each Sunday. In the next town the Catholics have Mass each Sunday in the Anglican church. Funerals were catered for Catholics by the Anglicans and for the Anglicans by the Catholics. We all shared the cleaning. Thank you once again Andrew for your reminder of what Christianity is all about. It appears that some of your readers have never read the story of the Samaritan Woman or the Woman who washed Jesus' feet.It was a wonderful gesture on the part of the Catholic Bishop and just sad that he was was forced to withdraw his offer. Let us pray for tolerance, and generosity. Have the poms returned all those catholic churches stolen by Henry V111? Andrew, thank you for your hospitable word. I believe that Jesus must weep at our pathetic attempts at Christian unity. Well said Andrew - yours may be a voice crying in the wilderness but many of us are listening. God bless you. Andy, like George Ripon, I felt slightly frustrated at the lack of factual background provided in this piece, and couldn't help feeling slightly conned as a result, being invited to indulge in a sense of moral superiority (unfortunately, this seems to come so easy to many of us when the target is the Catholic hierarchy) and to make a judgement in absence of any consideration of the actual circumstances. As a result, I think Fr MacAndrew's gentle chastisement is probably on the money. A counsellor friend described this attitude of superiority exemplified by your correspondent "Skye" 14-12-09 (please forgive the language) as "We like you but piss off!" With this kind of attitude, the ecumenical movement is dead. How sad ... and to Skye I would ask, perhaps God may be offended by this lack of charity, as well as by a bunch of human beings who have a personal need "to be right"? This is a very heartening decision. Discipline is finally beginning to return to the Church after decades of dissent and chaos. No Catholic Church should be available for ordinations of any church or community not in full communion with Rome. This is more the case when the ordination is void ab initio. The Catholic Church must stand by its beliefs and principles otherwise we just become another man-made intitution that is swayed by every false wind of doctrine. The Anglicans should have gone to the Uniting church in the first place. Robert Moore - my Jewish, atheist, Buddhist, Muslim, Anglican, Hindu, Pentacostal, Catholic and other friends and I get get on famously, love and respect each other greatly and recognise each other as precious in each other's eyes. My Buddhist friend has come with me to Mass and I have gone into a Buddhist temple etc. Just as I would never ask to have a priest's ordination in her Buddhist temple she would never insist on having a Buddhist monk consecrated in a Catholic church. Mutual respect arises from respecting WHO the other is and not pretending there are no differences. My friends and I have dinners lunches and all at many many places. Just today I got an email from a Jewish friend signed 'Love X', My friends know I have a deep love for them and I know they have so for me. Mutual respect arises from understanding the truth of who the other is, not pretending that we are all the same and ignoring the facts. Two steps forward, one step back - yes it was a wonderful and heartening thing to see Bendigo's Catholic Archbishop offer assistance to the Anglicans in this context - I am reminded of the exceptional papal 'simultaneum' granted so many years ago in the 1940s to a certain Br Roger Schultz in a little town called Taize in France, which enabled his fledgling Lutheran monastic brotherhood to use the Catholic church of that township for prayer on a regular basis - since they had need of such a sacred space - Taize is now known all over the world as a centre of ecumenical spirituality - a wellspring of renewal - a sign of reconciliation. The man who facilitated this 'simultaneum' to assist Br Roger and his communioty was much later to become pope ... In this instance for Bendigo this gift of goodwill was unfortunately retracted - it does not however change the reality of pastoral respect and collaboration which is obviously in evidence between the Christian churches on the ground in Bendigo ... small steps across the traditions but important ones for the future of the Christian Tradition as a whole. The Roman Catholic Church in the Diocese of Sandhurst(?) or anywhere else has every right to make such a refusal over an issue such as the Anglican Ordination of a woman as Deacon. That decision, I feel sure, was NOT one of inhospitality but making a statement of the official CATHOLIC and ORTHODOX position of no women deacons, priests or bishops - there is no such thing!! The Anglican Communion (Canterbury) is currently in its death throes, deservedly, because of its abandonment of Catholic practice. Ordination of women is only one matter in its path towards its demise. The real list is l o n g !!! Skye - Check your facts and lay aside the old Roman myth about invalidity of Anglican Orders that arose in 1896. Took Rome over 300 years to make that declaration! When Mary Tudor brought the English Church under Rome again there was NO wholesale 're-ordination' of appointed clergy who were ordained in the reign of Henry VIII or Elizabeth I. Anglican Ordination has at its heart the CATHOLIC character. Ordination according to the Anglican Rite IS the same as the Roman Catholic. The 'substance' with women being "ordained" is wrong and - well, ordained - they AREN'T!! Those who are so "ordained" are NOT part of the historic Apostolic line. Please do some non prejudicial reading of unbiased Church history, Skye. The Roman Catholic Church is not being inhospitable at all. Their decision was quite in order. Speaking, delivering a homily, and the like - no problem. Don't Anglicans worship the same God as Catholics? Filled with the same Spirit? I too would like to know if the the Order came from; Rome or locally. We Catholics in Australia have a very active Temple Police force. Seems to me that some of the respondents to this article are trying to be holier than the Bishop of Bendigo! It was the bishop, bless him, that offered (I repeat, offered) the hospitality. Then some higher authority ordered him to revoke the offer. The identity of higher authority remains a mystery, nor will it (or rather he) come clean, explain why, and answer questions. There may be a lot wrong with the Anglican Church, but at least its bishops and priests are allowed to think for themselves and to challenge the current orthodoxy. Bravo for the (Catholic) Bishop of Bendigo; would there were a few more like him. Good on the Bishop of Bendigo for standing up to the creeping disease that is liberalism by sending a clear message to all that the church tenets are not up for compromise. Liberalism and liberal Catholicism for that matter has been proven to be bung ideology that seeks to ignore the spirit of natural law and pick and choose the bits it likes out of doctine and scripture. The sooner these heretics are turfed out of the church the better. Liberalism is a cancerous disease that brings decay to all it touches (Western society, the Anglican church, the Uniting Church, The Jesuits). Let's hope we're all imbued with the spirit of hospitality tolerance and forgiveness in 2010 irrespective of what faith tradition we embrace. Fr Wade: "When Mary Tudor brought the English Church under Rome again there was NO wholesale 're-ordination' of appointed clergy who were ordained in the reign of Henry VIII or Elizabeth I. Anglican Ordination has at its heart the CATHOLIC character." 1. Surely you mean Edward VI, not Elizabeth I? 3. The failure to re-ordain in the 16th century Marian restoration, and the gap of some 300 years before a definitive magisterial ruling on Anglican Orders are not, I suggest, indefeasible arguments against the reasoning of "Apostolicae Curae". 4. I agree re. women "priests". I feel I need to comment given recent hardline messages. I have often wondered about the princple of "validity" of ordinations, as we find in Apostolicae Curae . . . a document in which one group of Christians tells another group of Christians that their leaders are fakes. Quite apart from the uncharity, and a sense of (to me at least) pharisaic superiority involved in this document, there is a further implication, specially for those who think it's wonderful that the church is now becoming more exclusive again! What this kind of thinking implies is that the Holy Spirit, which is God working within the material world, cannot decide how to act. Remember, it is not a bishop who ordains ... it is God acting through the hands of the Bishop. We also need to remember that God is greater than any human being . . . bishops included. The first is that the Holy Spirit chooses not to act, in which case we can say that God is playing favourites, and does not love all of his children equally, and the question can then be asked whether God the Holy Spirit has malevolent intentions. The second occurs if one says that God only binds on Earth those whom the Church is said to bind. That is to say, God does not act independently. It seems to me that if we follow this line of thought, then we have by implication created a new doctrine of the incompetence of the Holy Spirit. So either way, we are creating new doctrines which, perhaps not intentionally, do malign the Creator. Where is that wonderful warmth that used to exist at All Saints (previous seat of the church). We are all Christians, regardless of which faith we belong. Come on get with it. I am a Catholic and am ashamed that the Ordination was refused, I thought we were all christians, no wonder churches are finding attendances are dropping off, let us, and all churches work together, aren't we all working for God and our Saviour. When the Dalai Lama appeared, people flocked to the stage, mobile phone cameras in hand, so they too could own a piece of the Dalai Lama. As a measure of our cultural values, it is interesting to consider that the Dalai Lama has become a commodity.